Super Bowl XLVIII: How the Seattle Seahawks destroyed the Denver Broncos. How the Seattle Seahawks destroyed the Denver Broncos to win Super Bowl XLVIII. 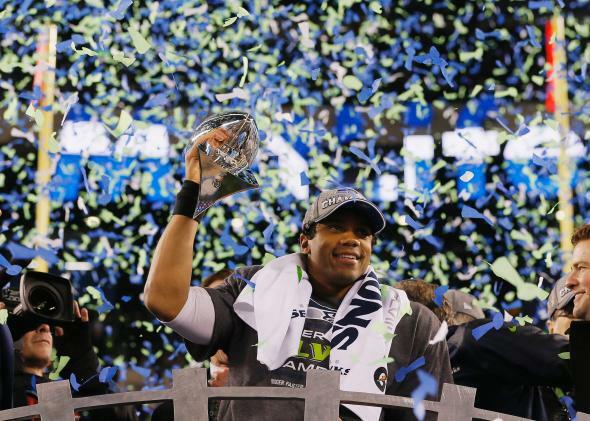 Seahawks quarterback Russell Wilson celebrates with the Vince Lombardi Trophy. The front page of the Denver Post website put it this way: “For Super Bowl starters, the Broncos suffered from a horrific case of stage fright. Jitters turned to panic. Panic leaked to disaster. Disaster became humiliation.” That’s a good start, but the Post’s list of sad Super Bowl nouns doesn’t quite capture the misery of Sunday night’s Broncos catastrophe. Humiliation turned into deep, unending despair. Deep, unending despair became profound emptiness. Profound emptiness transformed into convulsive sobs. Then the Seahawks scored again, and it was only the third quarter. Later, there were locusts. The NFL’s postseason tournament doesn’t typically crown pro football’s best team. Last year, the ho-hum, 10-6 Ravens hoisted the Lombardi Trophy. The year before, it was Eli Manning’s 9-7 Giants, who barely scraped ho-humitude before a late-season surge. But the 2014 playoffs were not a crapshoot. They were a coronation. The Seattle Seahawks, 43-8 winners in Super Bowl XLVIII, are pro football’s best team. The Seahawks are so dominant, and so overpowering, that it’s not really fair to say that everybody else is playing for second. It’s more like the rest of the NFL is playing for 53rd, or 177th. All hail our neon-green-accented overlords. On Sunday night in New Jersey, the Denver Broncos were definitely the best team wearing orange. Peyton Manning is a football genius. There is no defense he hasn’t seen before, no scheme he can’t outsmart. On the first play from scrimmage, Broncos center Manny Ramirez snapped the ball over Manning’s head. When the Broncos’ Knowshon Moreno fell on the prolate spheroid in the end zone, Seattle had a 2-0 lead after just 12 seconds. This, it turned out, would be one of the Denver offense’s best plays of the night: If Moreno hadn’t dived on the ball, Seattle would’ve had a touchdown instead of a safety. The best offense in NFL history, a team that scored a record 606 points this season, had been reduced to flailing around in its own end zone, desperately trying to abate its own ineptitude. Denver did not play well—Seattle, after all, took the lead without even really doing anything. Broncos coach John Fox also didn’t have a good day: His decision to punt from the Seattle 39-yard line with his team trailing 29-0 early in the third quarter elevated football-coach risk aversion to something more like hyper-milquetoast performance art. But this was less a Broncos defeat than a comprehensive Seahawks victory, one that validates Seattle’s coach, their players, and their remarkably uncomplicated defensive scheme. As Chris Brown explained in Grantland, Pete Carroll’s defense is at once aggressive and conservative. The Seahawks play press coverage on receivers at the line of scrimmage, taking advantage of their cornerbacks’ strong cover skills. Once opposing wideouts make their way down the field, they fall into a zone, relying on their safeties’ incredible range and hitting ability. For Manning, who thrives at picking apart defensive schemes, there wasn’t much to pick apart here. The Denver quarterback’s only clear strategy seemed to be extreme Richard Sherman avoidance. Manning kept finding Demaryius Thomas and Wes Welker on shallow crossing routes, and Seattle’s hyper-athletic linebackers and safeties kept smashing them after, at best, short gains. And when the Broncos tried to run to keep the Seahawks defense honest, that didn’t work at all. If you think Peyton Manning had a bad game, you are correct. If you think Manning played badly, you are probably the kind of person who likes to talk about legacies and clutchness and how you’ve gotta win the big ones if you want to be considered clutch—you know, for your legacy and all. The Seahawks talked after the game about how they’d figured out Manning’s “tell”—that they could discern where he was going with the ball by reading the quarterback’s eyes. This leads one to wonder whether other NFL teams fouled themselves up by assuming that Manning’s eyeballs fluttered around his skull randomly, or came to the conclusion that the Denver quarterback can only throw no-look passes. Either way, I have a hard time believing the Broncos were sunk by Manning’s not-so-withering gaze. Instead, Manning’s biggest problem was that no matter where he looked, he could not make Sherman and Earl Thomas and Kam Chancellor disappear. Manning set a Super Bowl record with 34 completions, which is perhaps the best testament to Seattle’s defensive greatness. Break a record against the Seahawks, and chances are you’ll still get embarrassed doing it. Seattle, too, got enough pressure up front from Cliff Avril to force Manning into two interceptions, one of which was returned for a touchdown by Super Bowl MVP Malcolm Smith. Given the four turnovers generated by his defensive teammates, the Seahawks’ Russell Wilson needed only to avoid falling into a sinkhole to lead his team to victory. Wilson did that and a fair bit more, scrambling to find receivers for third-down conversions and freeing himself for his own downfield scampers. In a game where he could’ve afforded to make some mistakes, Wilson made none. Though their skills aren’t parallel, Wilson calls to mind early-career Tom Brady. In his first years as a starter in New England, Brady didn’t have to do much to win games. Later, when the Patriots added more offensive weaponry and the team’s defense declined, he started to put up the numbers befitting an All-Pro quarterback. Wilson, too, clearly has the ability to throw for fat heaps of yards and touchdowns. But when you win the Super Bowl by 35 points, it’s hard to complain about a modest, 206-yard night. The Seahawks, with their 25-year-old quarterback and an overall average age of just 26, look like a team that’s going to need a bigger trophy case. If Percy Harvin—who, by the way, returned the second-half kickoff for a touchdown, to complete our comprehensive rundown of Bronco indignities—stays healthy for more than five minutes next season, then Seattle’s offense will get a lot closer to matching the star power of its defense. But Harvin may not be healthy. The only certainty about pro football is that it has a way of chopping down the sport’s most transcendent athletes. In the waning moments of the NFC championship game, Richard Sherman deflected a potential game-winning pass, then told everyone within earshot that he was the best in the world at what he does. In the Super Bowl, Sherman was carted off the field with an ankle injury. Though his crutches didn’t keep Sherman from celebrating his first Super Bowl title, his injury was a reminder that football transcendence is ephemeral. On this night, the Seahawks played one of the best games in Super Bowl history, setting a standard that will be tough for any other NFL team to match. Let’s hope this is the start of something great, and not both the beginning and the end of a pro football dynasty.